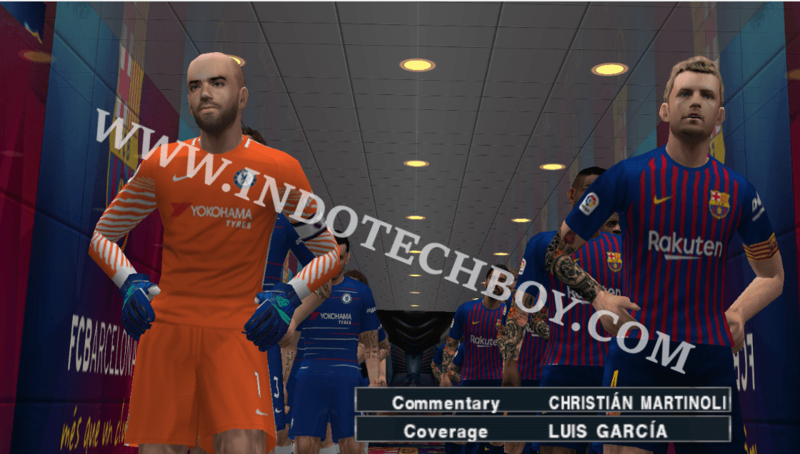 Indotechboy — After shared the Pro Evolution Soccer (PES) 2018 Mod Patch by Chelito 19 v4 PSP PPSSPP ISO ROM Game and the extra wide camera mod, now for the last step of ultimate modding of PES 2019 PSP game , here it is the HD Texture pack mod. This HD texture pack is created by Tutorialés Bendezu and will bringing you all new graphic including the latest players faces, kits, and jerseys to the PES 2018 Mod by Chelito 19 v4 PSP ROM game. What is this HD Texture Pack? It is a texture pack, comes with HD resolution (hell yeah ). Want to improve the graphic of the PES 2018 Chelito 19 v4 PSP PPSSPP game? Want to enchance your gameplay? Want to see you favorite players like Ronaldo, Messi, and others in their HD face ? Want to have a new look of stadiums, grass, jerseys, etc. when playing the PES 2018 Chelito 19 v4 PSP game? Then you got to try to use this HD texture pack mod. Just like the extra wide camera modding tutorial, applying this HD texture pack on our PES 2018 Chelito 19 v4 PSP ROM game is also safe because the original ISO ROM is untouched at all. Again, I only applied it using emulator application though (PPSSPP), I don't know if this HD texture pack can also be applied in the real PSP console . Tattoos. Some players for example Messi have their special signature tattoos. National teams uses federation emblem instead. 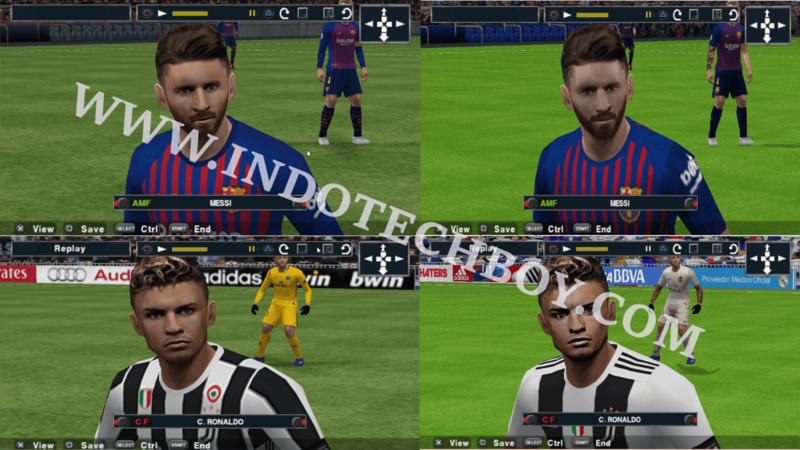 PES 2018 Mod Patch by Chelito 19 v4 PSP ROM game. The HD texture pack files (download section is at the end of this post). Latest PPSSPP emulator installed on your device. At least 200 MB empty space on your device. Archive manager (zip) / extractor application installed on your device. Some example the bests arhive manager application / program are Zarchiver (Android), WinRAR (PC). Download the HD texture zip file for PES 2018 Chelito 19 v4 PSP ROM game, "Texturas PES 2018-2019… .zip" (download section is at the end of this post). Extract the the HD texture zip file. From the extraction folder, you will find an "ULUS10597" folder, and a "Grass.png" file. Move all the contenst from the extraction folder on step #2 into your /PSP/TEXTURES folder. If "TEXTURES" folder is not present in your PSP folder, then create it by yourself. Open PPSSPP emulator application / program and run your PES 2018 Chelito 19 v4 PSP ROM game. Enter the PPSSPP menu –> "Settings (Game settings)" –> "Tools" –> "Developer tools". Look on the "Texture replacement" section at the bottom. Next, enable / tick the "Replace textures" option. Now back to play your PES 2018 Chelito 19 v4 PSP game, and done! The new HD textures should be applied to your game right now. But before using this HD texture pack on your PES 2018 Chelito 19 v4 PSP ROM game, I must warn that this HD texture pack is sure need a high system specification. Applied this HD texture pack on my Advan Vanbook W80 Windows tablet that has 1 GB RAM and Quadcore processors using the latest PPSSPP (v. 1.6.3), the PES 2018 Chelito 19 v4 has some much stuttering. The stuttering happened the most between loading time. On the other side, the stuttering pretty much cannot be noticed when match playing time. All credits are belong to the creator of this HD texture pack for PES 2018 Chelito 19 v4 PSP ROM game, Tutoriales Bendezu. Comments (1) in "HD Textures Pack for PES 2018 Chelito 19 v4 PSP PPSSPP ROM Game"